I hope you find these dolphin drawings very easy to recreate in your sketchbook. Below you can see a simple outline to copy a few times - this helps you achieve good results in a finished image. 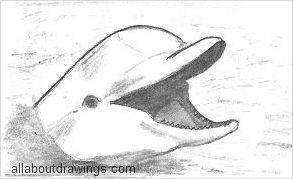 Pencil drawings of dolphins easily depict how playful and intelligent this animal appears to us. I think most of us feel an affinity with dolphins. Dolphins are rated as one of the fastest animals in the sea. They are small, toothed whales with a long snout and are related to porpoises. They are mammals not fish. In the drawing below he is poking his head up out of the water to grin and greet you. You would have to be pretty quick if you want to do a dolphin drawing from real life! Wild dolphins love to race ahead of ships and it is a wonderful sight to witness. The following summary is useful if you want to create successful images. The main difference between a dolphin and a porpoise is in the snout and teeth. The snout of a dolphin looks like a beak and the teeth are cone shaped. The porpoise snout is rounded and the teeth are flat or spade shaped. Most people just consider them to be the same mammal because of their similarities. A male dolphin is called a bull and the female is a cow (that makes me wonder if they suffer from an identity crisis!) The baby is called - you guessed it - a calf. When the calf is born, it is one third the size of its mother. have a torpedo-shaped body that enables them to move through water quickly and easily. have flippers that are shaped like paddles and most have a dorsal fin on their back. Together the flippers and fin help with balance while they swim. powerful tail fin is called a fluke and this propels them through the water. have a smooth and rubbery skin. Underneath the skin is a layer of blubber which keeps the animal warm. need air and they breathe through a blowhole on top of the head. have very sensitive hearing and good vision. Most live for about 25 years with the shark being their main threat. Bottle-nosed dolphins live in groups of 12 but some groups consist of 100 up to 1000. These groups hunt and play together. The history of dolphins goes back thousands of years. The Ancient Greeks considered them as sacred to the God Apollo and they appear in Greek and Roman mythology. Sailors thought it was a sign of a smooth voyage if dolphins appeared near their ships. 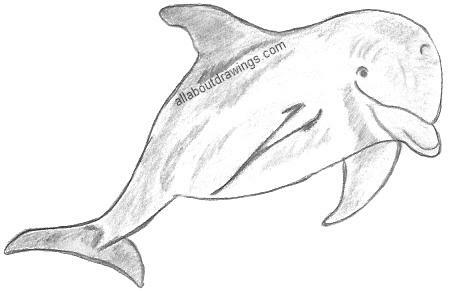 For this dolphin drawing, I copied the outline that you see at the top of the page and then finished it off with some shading and extra lines. Simple graphite shows this beautiful creature in its true color so who needs color pencils at times like this? I know I've said this lots of times, but truly, you should try to produce a dolphin drawing yourself, just start off by copying the outline first. It may surprise you to discover that drawing is very easy when you try. I love receiving letters of thanks from people for inspiring them to draw because I definitely want you to receive the fulfilment that drawing provides.